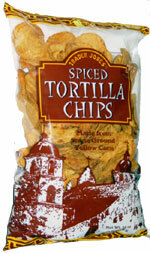 Taste test: These are round, large tortilla chips (over 2 inches in diameter) with a salty, spicy seasoning on them. 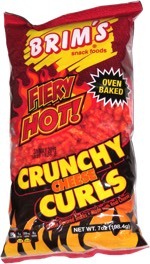 They're crunchy and very tasty, with a sort of a garlicy tomato taste. They're fairly thick and strong enough to handle most salsas without the risk of breaking. Not all that crisp, though, just slightly on the stale side. They leave behind a mild, spicy aftertaste. Smell test: Very nice, mildly spicy smell.